The U.N. health agency on Tuesday reported at least 13 new cases of polio in Indonesia, bringing the country's known total to 100. The new cases were confirmed in the provinces of Banten and West Java, areas that already are undergoing large scale-immunization campaigns, the World Health Organization said. "None of the new cases are from a new area," said Oliver Rosenbauer, spokesman for WHO's polio eradication program. "They don't represent a spread (of the disease), but obviously the number is still going up. "There are still going to be more cases," Rosenbauer added. Saturday, the U.N. health agency reported a case of polio in Angola - the first there in four years. Angola's Ministry of Health contacted the World Health Organization last month after a 17-year-old girl living in the capital of the African nation developed paralysis in both legs. Rosenbauer said her case was unconnected to a West African polio strain that has spread to 16 countries in Africa and Asia. "It's a polio case genetically linked to a virus circulating in India," he said. Yemen - which has had 284 cases since the virus turned up earlier this year - and Indonesia are the latest of 16 previously polio-free countries that have reported new cases of the crippling disease since 2003 after a vaccine boycott in Nigeria was blamed for causing an outbreak that spread the disease to other countries. Last year, some 1,267 people were infected in the world - 792 of them in Nigeria. The total new cases this year stands at 618, according to WHO, with Yemen listed as the worst-affected country. 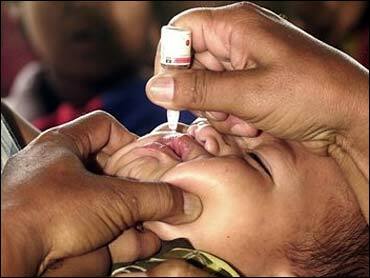 When WHO launched its anti-polio campaign in 1988, the worldwide case count was more than 350,000 annually. Polio is spread when people who are not vaccinated come into contact with the feces of those with the virus, often through water. It usually attacks the nervous system, causing paralysis, muscular atrophy, deformation and sometimes death, though only about one in 200 of those infected develop symptoms. The disease is still endemic in six countries: Nigeria, India, Pakistan, Niger, Afghanistan and Egypt. Rosenbauer said an investigation has begun to determine how the girl in Angola contracted the disease. There had not been a case of polio diagnosed in Angola since September 2001, he said. A national immunization campaign has already being organized for the end of the month by Angolan officials who felt the country was at risk of importing the disease from its neighbors, Rosenbauer said. A second round now is being planned for August, he said. It takes normally several doses spread out over a few months to fully protect children from polio. Ideally, four doses should be given in the first year of life. However, in emergencies such as outbreaks, health authorities launch three rounds of vaccination for all children under 5. The doses are given once every four to six weeks. Angola has been hit hard by health epidemics recently. An outbreak of the Ebola-like Marburg virus has been brought under control in Angola but only after killing more than 300 people. Marburg virus spreads through contact with bodily fluids and can kill rapidly, usually about nine days after the first symptoms. WHO has warned that new cases might be still emerging and any one of them could spark a new crisis.